Delivering top-of-the-line performance and precision, the Team Lew's Custom Pro Speed Spool ACB Casting Reel is packed with Lew's most advanced features and technologies. 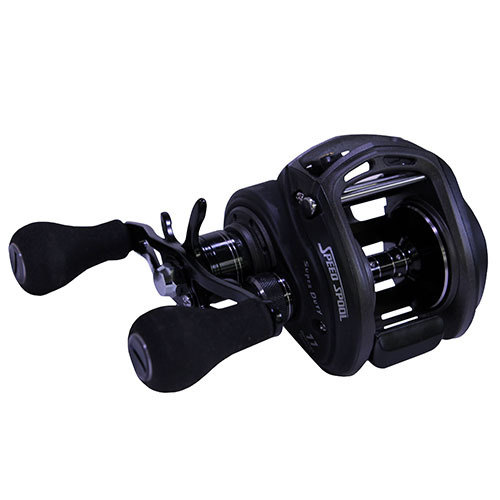 Also offering the reliability and durability anglers have come to love from Lew's, it features a one-piece aluminum frame and strong, lightweight C45 Carbon sideplates in Lew's exclusive Super Low Profile Reel Platform. The lower profile platform makes it one of the lowest profile reels ever created. Hard aluminum alloy gears provide a tremendous amount of power, and the premium 11 double-shielded stainless steel bearing system ensures ultra smooth functioning. Delivering excellent casting capabilities as well, the externally adjustable 4-pin, 27 position ACB SpeedCast centrifugal braking system allows you to cast a wide variety of lures in all weather conditions. Each reel also features a rugged carbon fiber drag system that dishes out up to 14lb of max drag power. Offering premier performance from Lew's, the Team Lew's Custom Pro Speed Spool ACB Casting Reel has what it takes to fish at the highest levels of competitive bass fishing.